To get from the Everest base camp (EBC) to the summit of Mount Everest, climbers have to first acclimatize slowly to the extreme altitudes. If an athletic person would be transported directly from sea level to the 8,848m summit he/she would only survive a matter of minutes, according to a book I read. However, the human body is able to adapt gradually to higher altitudes by acclimatizing. People get affected by altitude sickness at much lower altitudes than the 5,350m altitude of EBC. It’s quite common for trekkers in the Everest region to have to be evacuated by helicopter due to AMS (Acute Mountain Sickness) – in fact this happened to one of our fellow EBC trekkers in December 2012, whilst others got sick to different levels mostly related to the altitude. People handle altitude differently depending on their physical composition, but it is not strictly related to general overall fitness: indeed many super-fit marathon runners types collapse under severe AMS during high altitude expeditions according some guides I have spoken to. So, the name of the game is acclimatizing! Between EBC and the Summit there are four different camps, and now that we have spent some time acclimatizing in EBC we will spend a few weeks to go up to different levels of altitude on the mountain / the different camps and then back down to base camp, before we are acclimatized sufficiently that we are ready for our summit bid. The timing of the summit bid will then depend on when there will be a good weather window to get up to the summit – essentially when the wind is not so strong that you will be blow off the summit! Starting from EBC, the climbers have to first pass through the Khumbu Icefall, which is in essence a “broken” glacier, full of ice cliffs, seracs, and crevasses. From a distance it looks totally impossible to pass through… However, the route through the Icefall is set up by a team of Sherpas called the “Icefall Doctors”. They are employed by the Sagarmatha National Park (and financed through the permit fees). 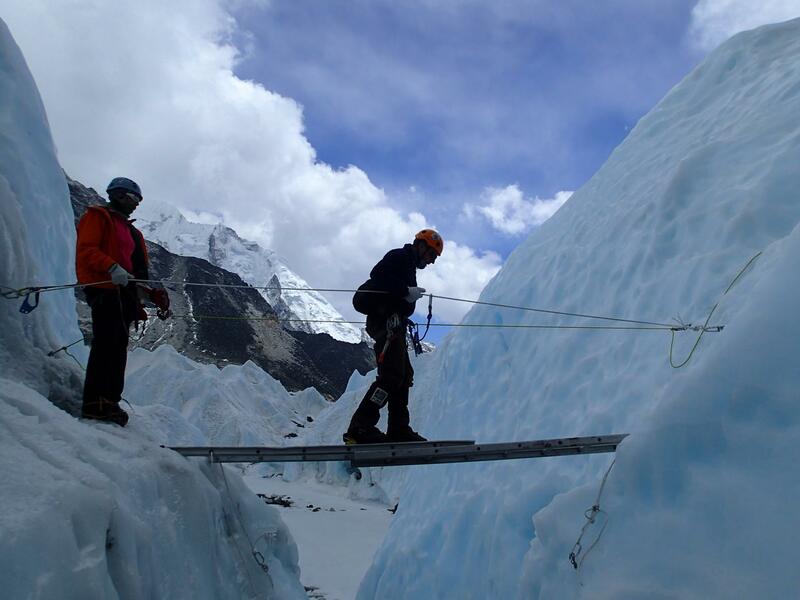 It’s their work to fix ropes and set up ladder crossings through the icefall. We have started to have shorter walks up the icefall, and it is a very dramatic landscape indeed. We have also practiced relevant skills for ladder crossings, ascending fixed ropes in steep terrain and rappelling down ice walls, as well as – importantly – having a 100% focus on safety. 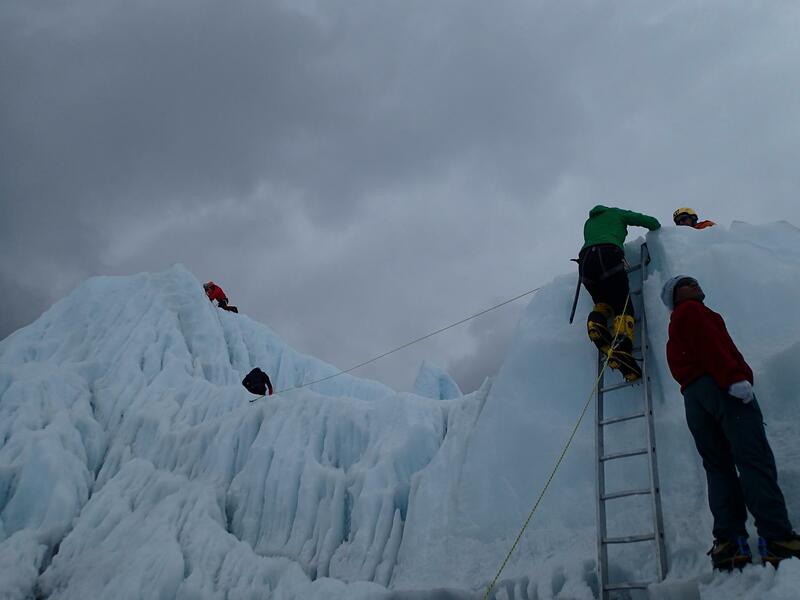 We will shortly be passing through the entire icefall as we start our acclimatization program up to Camp 1 and Camp 2. Our plan is to leave at 2am and arrive by 8/9am in Camp 1. Below are some pictures from our training in the lower icefall to give you an idea of the terrain. 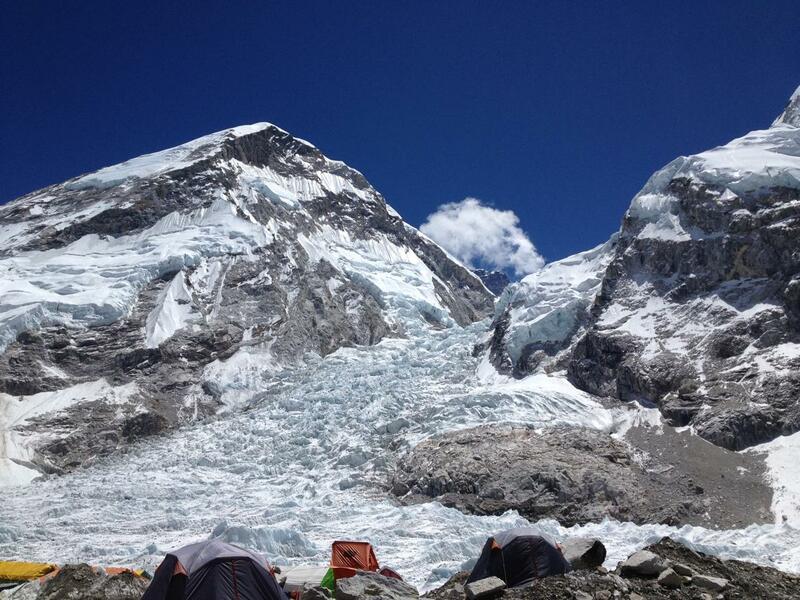 Just above the icefall, in an area known as the Western Cwm, is Everest Camp 1 at 5,900 meters. The Western Cwm is a massive snowfield flanked by Everest’s SW face, with Lhotse to the east and Nuptse to the south. In the sunlight, this area can become a bit of a cauldron and hence heat up quite a lot, so you not only have to deal with extreme cold but also quite a bit of heat, making it more challenging to dress appropriately, or –to use a more fancy term – to thermoregulate. We will leave C1 at first light and ascend the 500m to C2, which is located at the upper end of the Western Cwm. C2 serves as an Advanced Base Camp (ABC), where we will have the luxury of tables and chairs in our dining tent, similar to EBC. On our first acclimatizing rotation, we will make a first stop at C1 and spend the night or a couple of nights, and then move on to C2 and spend a couple of nights there as well before returning back down to base camp. Later, we will go straight from base camp to C2. From C2, we will first have a gentle 1 hour of glacial walking before starting the climb up the famous Lhotse face, where we will climb part-way up the face of Lhotse, Everest’s neighbor and the world’s 4th highest peak at 8,516m, up until we reach Camp 3 and later eventually Camp 4 at Everest’s South Col, from where we will later make our summit bid. The Lhotse face is a steep section of snow and ice slopes, and the ~ 1,000m climb from C2 to C3 can be quite strenuous especially in the thin air. 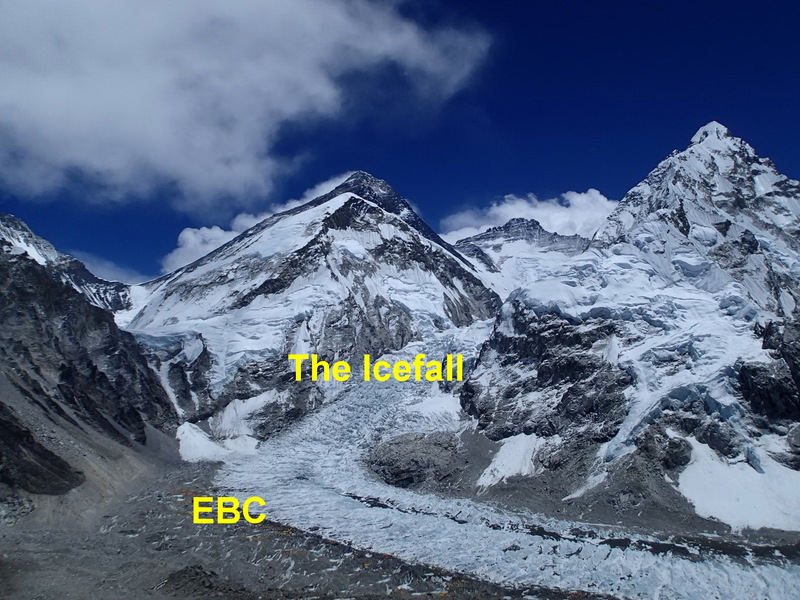 On the second rotation, we will climb from EBC to C2, and then to C3 and spend one night, and thereafter climb a short bit beyond it before returning back down to base camp. We do not use bottled oxygen until our summit bid. Our acclimatization program is done once we have been to C3 and descended to EBC again. Thereafter we will descend down valley to about 4,000m (likely to Pheriche) for a few days to further build strength before our summit bid. After our “low” altitude rest period, we return to EBC and wait for the right weather forecast for our summit bid. Once this happens, we set out from EBC to C2, then C3 where we will sleep with oxygen masks. Then the next morning we will climb with oxygen up to C4 on Everest’s South Col at 7,950m. Two technical rock sections need to be negotiated: “the Yellow Band” and the “Geneva Spur” before we reach C4. Wind conditions can be quite extreme in both C3 and C4 as the camps are quite exposed. Summit Day begins from South Col in the evening, at around 10pm. We climb the 900 meters to the summit through the night in order to arrive in the morning/lunchtime depending on our pace. After traversing the South Col, we arrive at the “triangular face” which we climb up to the “balcony” at 8,600m where we join the southeast ridge, and later reach the South Summit. From there we have another two hours on the ridge to get to our goal: the main summit! On the way there, we have to climb the famous Hillary Step before we get to the Top of the World! And that’s only half-way: we have to get back down again!